As winter ascends, bring life and energy indoors with the vibrant colours of the natural world. Glasshouse Greenery welcomes nature’s luxe colours inside with cosy, decadent textiles. With a colour palette inspired by the deep jewel tones of oceans and lakes, Glasshouse Greenery brings these refreshing tones into the home to create an energetic, flourishing space. Soft furnishings in inky teals and navy blues are complemented by the wood grains and tinted glass features in the hard décor range. Introduce a rich green as a natural backdrop, then layer lush tones of blue contrasted against textured neutrals. Finish the look with bursts of fresh greenery. Textures are essential within the collection, creating warmth within the home through chunky knitting and relaxed, woven textiles. Rich, romantic gem tones are featured in the collection through decadent velvet. 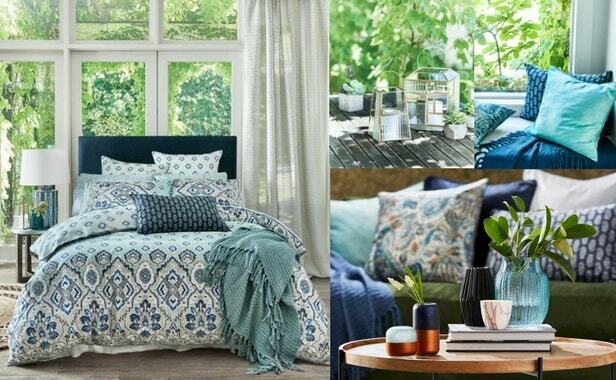 Luminous blue velvet cushions are layered upon each other with features of paisley and ombre, warming the home with the fabric’s soft, sophisticated lustre. Create a relaxed unity between the home and the outdoors this season and immerse yourself in Glasshouse Greenery.